Product #17436 | SKU LRWHR1RBNA | 0.0 (no ratings yet) Thanks for your rating! 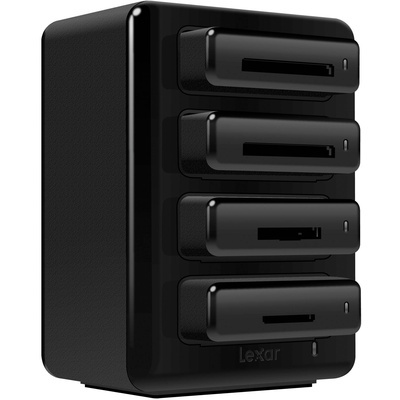 The Lexar Professional Workflow HR1 Hub is a modular four-bay reader hub designed to accept up to four optional dedicated card readers. This solution enables quick, USB 3.0-speed transferring of files from up to four memory cards simultaneously. The unique configurable structure of the hub allows users to insert a variety of reader types based on personal needs, with the ability to use either four of the same or any combination of SDHC/SDXC UHS-I and UHS-II, microSDHC/microSDXC UHS-I, CompactFlash UDMA 7, CFast 2.0, or XQD card types. Also available for the Workflow HR1 Hub are two flash storage drives with capacities of 256 and 512GB. These optional drives help make it easy to store your transferred files. Included with this hub is a USB 3.0 cable and a power supply with North American and Australian power adapters. Modular four-bay memory card reader hub accepts any combination of up to four Professional Workflow SDHC/SDXC UHS-I, CompactFlash UDMA 7, or XQD readers. Enables high-speed transferring of files from up to four memory cards at once. Hub design eliminates cable clutter by requiring just one USB connection to support multiple card types. USB 3.0 support, and USB 2.0 backward-compatibility, for quick offloading of data is ideally-suited to RAW and high-resolution photos or HD, 3D, or 4K video files. Future-proof design enables hub to accept any future supported card types or formats. Compatible with Mac OS X 10.6 or later and Windows 7/8 operating systems.